"A reader lives a thousand lives before he dies.. The man who never reads lives only one"
In my second year of teaching, my goal is for each scholar to grow 2.5 reading years. By getting texts that are from various levels and topics of interest, this will help close the gap. Our scholars are in desperate need for strong instruction in the area of literacy. In our first year of existence, we started the school year with only 3% of scholars reading on grade level. However, after analyzing winter reading data, we saw that 25% of our scholars can now read on grade level. That's huge in six months, but we must continue to progress forward. In the Achievement School District, the goal is to take the bottom 5% schools; and in less than five years, the vision is to take those schools to the top 25%. By increasing my classroom library with new books, scholars will find a book that will captivate their interest. Increasing student engagement and passion for reading will allow my scholars to become lifelong readers. It is unfair that my scholars must endure these statistics. I believe my scholars can overcome any odds and consequently, have the power to redefine statistics. This project will help my scholars deepen their understanding of the world. 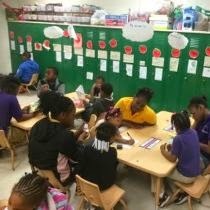 To improve the literacy program in the 2014- 2015 school year, I am hoping this Donor's Choose project can support scholars by increasing both literacy resources in terms of reading levels, multiple genres, and expanding various areas of interest. The hope is that scholars will be exposed to a rich variety of text that allows them to exposed to a world outside their own community. Entering the upcoming school year, my scholars are currently limited with the resources within my classroom library. Some students must share the same books and unfortunately,all my kids don't have the resources to read at their independent level and spark their interest like a normal library should. By widening my classroom library, kids will have everything they need to reach their goals and what's more, scholars can select from a wide range of books that can captivate their interest. These resources will give my students the tools to become readers and will also put them on track for college. My students need books! I want my scholars next year to deepen their imagination by reading texts that are from various levels, genres, and topics of interest. This Donor's Choose project will help me close the achievement gap by allowing my scholars to access a rich variety of texts. Moreover, this project will help me spark the interest of 5th grade minds and also help me shape lifelong readers. This project cannot happen without your support. It takes a village to raise a child. We are doing everything we can to bring our scholars to grade level. However, we need the proper tools and resources. Help me make this dream become a reality. My students need books! I want my scholars next year to deepen their imagination by reading texts that are from various levels, genres, and topics of interest. If you would like to help Mr. Akinmoladun reach his worthy goal, you can learn more here. If you want to find your own project whether it's about reading, science, art or math, you can find it here. Thanks so much for helping Mr. Akinmoladun expose his students to new books! We so appreciate all you do to support classrooms on DonorsChoose.org.